There’s a part of you that wonders if the British Library has designed this entire exhibition as an ‘up yours’ to Brexit. Because the first thing you see, as you walk around this heady exploration of Anglo-Saxon treasures and literature, is an explanation of a worryingly Continental fact: we’re all bloody German. Or Danish. England as a nation was established by invading Angles and Saxons – Germans and Danes. All your St George’s flag, shirts off down the Post Office, 18 pints on a Tuesday lunchtime English pride is actually one of the first fruits of our blossoming relationship with the proto-EU. This is not new news, obviously, but the timing feels a little too apt to be coincidental. When the Europeans came over here, they brought a lot with them, and in the process helped establish the first written form of English. Spread out across these dark, powerfully atmospheric rooms is the result of that – religious manuscripts, books of poetry and herbal remedies, census tomes, enormous Bibles. 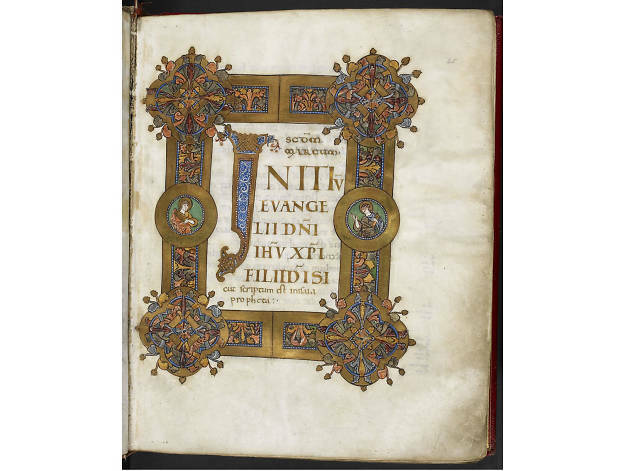 You’ll find the earliest English laws here, the first English letters, the first complete Latin Bible. It’s the literary birth of England, and it’s hugely dramatic. Twisted ornaments from the Staffordshire Hoard glitter in a glass cabinet, the first objects to really jump out at you. There’s an enormous cross in the middle of one of the rooms too, and the unbelievably beautiful little Alfred Jewel. 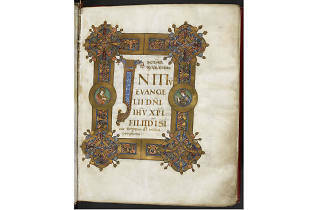 But – appropriately for the national library – most of the show concentrates on rare books: a single stunning illuminated page from the ‘Lindisfarne Gospels’, a shimmeringly decorated page from the ‘Golden Gospels’, works by the great historians of the time like Bede, letters from kings, the incredible ‘Domesday Book’. Serpents, servants, kings and constellations. It’s glorious stuff. Don’t get me wrong, the sheer amount of unreadable reading material here will only appeal to the most academically minded, but there’s a lot to like. What’s happening in these rooms is a soap opera of power, of kings establishing kingdoms, losing power, merging and conquering, killing and being killed. There’s Alcuin of York influencing Tours in France. There’s the English delegation going to Rome to get permission to dissolve the archbishopric of Lichfield. Europe was a big, interconnected, fluctuating confluence of power and influence. Britain, the Venerable Bede reckoned, was a melting pot of four peoples (Picts, Scots, Britons and Anglo Saxons) and five languages (that lot plus Latin). Britain flourished because of outside influence, because of trade, religion and knowledge from elsewhere. Without it, we’d just be a bunch of inbred illiterates chucking mud at each other on Hampstead Heath. Stick that in your referendum.